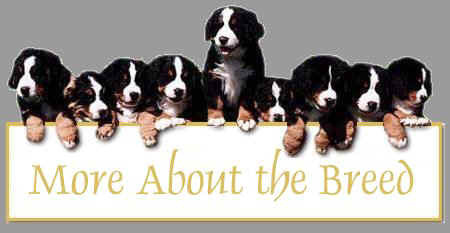 The Bernese is a breed which needs human companionship, and must be made a part of the family. They are a gentle breed, very affectionate and extremely faithful. I've found that they make excellent children's companions and if properly introduced, can get along very well with other pets. They are not as boisterous as Labrador Retrievers and tend not to chew, but they do require consistent training as they are a little stubborn! They make good watch dogs, but are terrible guard dogs. A Bernese can be quite reserved around people they don't know, but once they have accepted someone as a friend, they will remember them all their lives. They are not suited for long and arduous hikes, lacking the endurance of other working breeds. They shed their coats once (or twice for females) a year. Not prone to drooling. They are not natural swimmers, nor natural retrievers. They have a tendency to dig holes. Hip and elbow dysplasias are common conditions in Bernese Mountain Dogs. These are structural defects in the joints that can cause mild to crippling arthritis. To avoid the possibility of orthopedic injury, a Berner should not be asked to jump or pull loads before the age of two. Coming from a working background, Berners enjoy the challenges of learning new things. Most Berners are eager to please their owners and can be trained quite readily in a variety of areas. Because of the breed's eventual large size, it is to the owner's advantage to begin obedience at a young age. 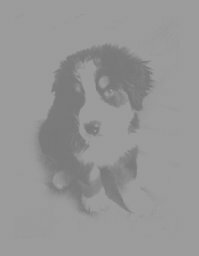 However, since Berners as a breed are slow to mature, both physically and mentally, owners should not push puppies in training too rapidly. The training of a Berner puppy requires firmness, consistency, and lots of patience, and is most successfully accomplished with many brief, fun training sessions. Despite their large size, the majority of Berners are real softies and do not do well with harsh corrections. The name Bernese Mountain Dog is a rough translation of the German "Berner Sennenhund," which literally means Bernese Alpine Herdsman's Dog. The breed's original name was Durrbachler, after an inn where these farm dogs were bought and sold. The modern breed was developed from dogs found in the countryside around Bern, Switzerland and is only one of several Swiss breeds. The original Berner Sennenhund was an all-around farm dog, used to guard the farm, drive the cows to and from their mountain pastures, and pull carts loaded with milk cans to the dairy; modern Berners retain some, although not necessarily all, of these instincts. The breed was rescued from near extinction by Professor Albert Heim around the turn of the century and has developed slowly since then. In 1948 there was a significant outcrossing to a Newfoundland dog, with a resulting improvement in temperament and increase in size.